ken has to have another chat with Peter. This time its in the dressing room just before they shoot their Christmas video greeting. Proving that there's no such thing as "concrete" good news for the IndyCar Series when Danica Patrick is involved, Patrick's official website gave eagle-eyed visitors a glimpse of the tiny speed diva's plan of attack for the future in advance of an official announcement. 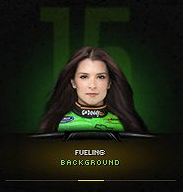 The image, part of a Flash loading screen, shows Patrick wearing a GoDaddy.com racing suit - not surprising considering that only hours before her handlers had rolled out the official news of her three-year deal with Andretti Autosport and GoDaddy. What is a bit surprising is that Patrick is clearly wearing the wrong GoDaddy.com suit. Wrong, that is, for a driver whose primary focus is supposedly her IndyCar career. Anyway, we post this for your convenience to prove that, in fact, it is possible for Danica's new GoDaddy colors to possibly look uglier.